At its best, California's red tide can be as mesmerizing as the Northern Lights' winter dance, the summertime glow of fireflies, or the simple pleasure of a glow stick from the dollar store. At its worst, it coats California beaches with a smelly, frothy mess that looks like the aftermath of a grubby two-year-old's bubble bath—and smells even worse. Why do you need to know about red tide if you're going to California's coast? If it's happening, you may want to see the ocean glow at night. Just don't let long photographic exposures and hyper-exaggerated edits on Instagram or Flickr fool you. Viewed in person, the effect is more subtle than stunning. You can see what it looks like at its best on YouTube. During the day, it's best to avoid places that are affected by a red tide. The National Institutes of Health say the species that causes it can also cause "a peculiar, strong odor." That might be an understatement. If you go to an affected beach during the day, you'll end up holding your nose and wondering what is creating that awful stink. Oddly, the name "red tide" is about as wrong as it can get. In California, it isn't always red. And it has nothing to do with the ocean's monthly rise and fall. In fact, it can happen at any time. Tiny ocean creatures called dinoflagellates create this phenomenon. When conditions align, they multiply quickly. If the species is red-tinted, it can make the water look red. But it's what happens at night that makes a red tide magical. Those tiny organisms glow with an electric-blue color when they are moved. When a wave crashes at night, so many of them do that at once that you can see a brilliant flash of light lining the wave's crest. Maybe it's because they're so close to the center of the entertainment industry, but it's almost as if those tiny sea critters know when to get ready for their performance. The substances that generate their bioluminescence are destroyed daily and regenerated just in time to cause a spectacular natural light show after dark. Why do they glow? No one seems to know for sure, but some scientists think it may be an adaptation that helps them startle potential predators. A few people also call it a red tide when a lot of tiny, red tuna crabs come onto the shore all at once. That's also an interesting thing to see, but it won't make the water glow. And those cute little crabs smell worse than the dumpster behind the local seafood joint when they start to rot. Red tides can happen anywhere along the California coast. One of the largest and longest-lasting ones occurred near Monterey in 2016. They're more common where water temperatures are warmer, between Santa Barbara and San Diego. The coast at La Jolla north of San Diego is one of the best places to see it and is often listed among the best places in the world to see the ocean glow. 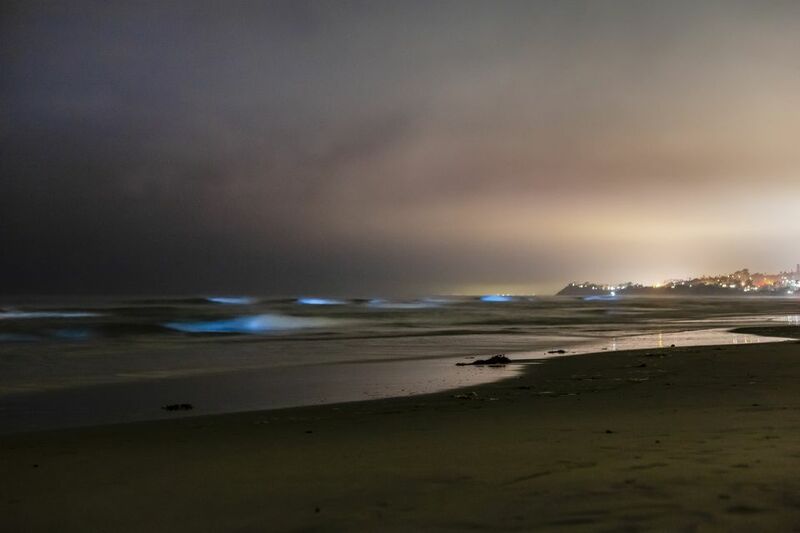 Luminous waves are also a frequent occurrence at Orange County beaches. Red tide is more common in February, March, August, and September, but it's impossible to predict precisely when it will happen, or how long it will last. An easy way to find out whether one is going on is to search for local news about red tide in California. The glow will seem more intense when the sky is darkest: on a moonless night or when the moon is new. Look for a beach with a lot of waves breaking for the best display. In general, California red tides are less toxic than the ones that occur in Florida. Sometimes, a California red tide is completely harmless. Under other conditions, the microorganisms release harmful toxins which can irritate the skin. You will find warnings about that posted at any affected beach. Your best bet is to just stay out of the water if it looks reddish-brown.